➥Adjectives and adverbs are describing words; the former describes a noun or pronoun; the latter, a verb, adjective, or other adverb.An adjective describes a noun or pronoun. An adverb describes a verb or anything apart from a noun and pronoun. Adverbs are used to answer how questions. 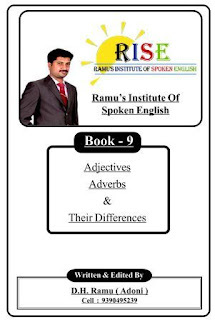 Adjectives and adverbs are among the eight parts of speech in English language. There is a lot of difference between an adjective and adverb on the basis of their usage and types. Adjective is a word that describes, qualifies and identifies a noun or pronoun, whereas an adverb describes a verb, adjective or other adverbs. An adjective usually, but not all the time, comes before the noun or the pronoun which it describes.